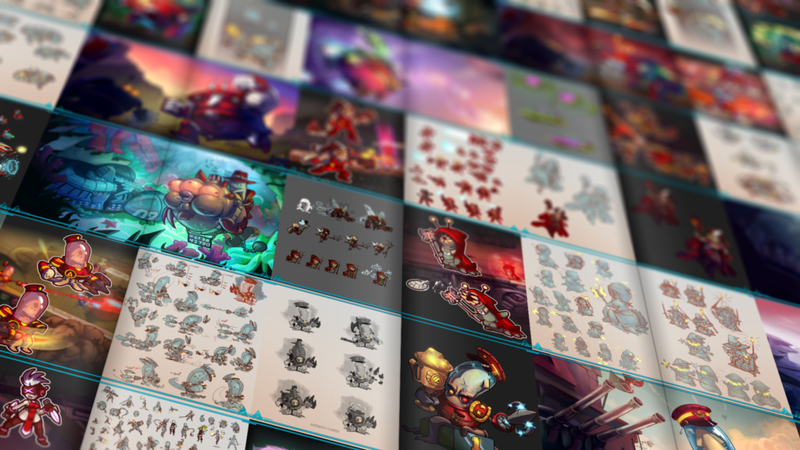 The Art of Awesomenauts – Now available to all eligible backers! We just sent out a message to all players who backed the Awesomenauts: Starstorm Kickstarter campaign at the Bronze tier or higher, with a link to a Humble Reward page where they can download The Art of Awesomenauts – an art book spanning over 400 pages, covering the entire history of Awesomenauts! This art book is only available to players who backed the crowdfunding campaign at the Bronze Tier or higher. Players who backed through Kickstarter will have received an email about this, and players who backed through Paypal or through our website after the Kickstarter campaign ended will have the art book automatically added to their existing rewards page. That means you can grab your copy of the art book from the same page where you got your other keys. Log into Kickstarter and double-check which email address you have registered there. The reward will have been sent to that address. Double-check whether you pledged at the Bronze Coco / Leon, Silver, Gold, Thormium, Awesomantium, or higher tiers through Kickstarter. Double-check your spam folder on your registered address. Send an email to robin@ronimo-games, and please let us know your Backer ID for the Awesomenauts: Starstorm campaign. This will make it easier for us to look up your rewards. If you are not able to access the inbox at the address you have registered with Kickstarter, we will not be able to recover your rewards without your Backer ID for this campaign. Thanks for supporting our crowdfunding campaign – Awesomenauts wouldn’t have grown into the game it is today with you! If you haven’t supported our crowdfunding campaign yet, you can still do so through our site: http://www.awesomenauts.com/Kickstarter/index.html. You’ll get loads of digital content, including the Digital Art Book when you pledge at the Bronze Leon or Bronze Coco tier, or higher.